I am so excited for this year right now for no good reason than I just feel good about the number 2010. It sounds so wholesome and peaceful and exciting. It's even and round and has a Ten and if you haven't noticed, I like tens. So much is going to happen this year – I can feel it. There are the scheduled awesome things like weddings and birthdays *cough10-10-10cough* and I also know of six (!) babies that are going to be born in July 2010! Hello, baby knits! I am so excited for all the mom-to-bes and am wishing them all safe and healthy pregnancies. I'm already making plans for grand schemes like blogging more, photographing more, and maybe doing other crafty things. (Crochet? Sewing? dare I say, embroidery?) OH and there's also the goals of being a better person, wife, sister, daughter and the finding the key to world peace. Perhaps for now I'll just concentrate on knitting. Day 3 of 2010 – baby I am all over you! My feet are perpetually cold. Like super frozen, always manage to make my husband yelp in bed kind of cold. I didn't help them much because I used to be the type to never wear socks or even tights on the coldest of days. Now I can't get enough of either. When we moved to our new 1st floor apartment and it's super cold floors I couldn't stand my own cold feet any longer and decided to remedy the situation. They are loosely based on the Men's Socks for Giving from the Purl Bee. I changed the sizing and the striping and really wing'd the whole thing because I was on the road and didn't have a pattern in front of me. I actually almost tried out the short row heel on this pair but pulled it out because I didn't like how it was coming out. Oh look another goal: short row heels. There is no lack of sock information on the internets. Socks can be made cuff down, toe up, sideways!, with short rows or gussets or neither! Anything you can think of it's out there. Knittas love their socks. Today is also my last day of winter vacation. January at work is always my busiest. It's the time of year that requires some longer days and night events. I love what I do so it's really not terrible but I really have been enjoying being a little lazy these past few days. 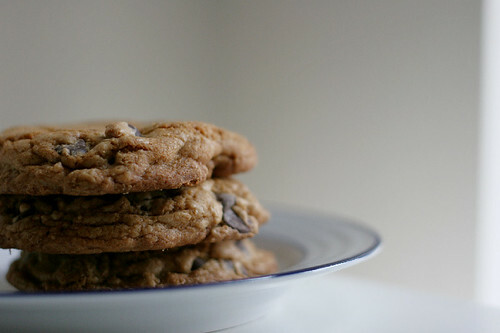 I've made a batch of chocolate chip cookies to cheer me up. From Joy the Baker. Yes, that's much better. Here I come, 2010. Get ready. * I was talking about this briefly with some of my knit friends today – what are you calling 2010? Twenty-ten or Two thousand and ten? I opt for twenty ten because I just do. The less syllables the better. I think I’m going to say twenty ten. Lovely socks – they look so warm! Good luck with all the busy work stuff. The cookies are sure to help power you through – yum! Twenty ten, and I agree, there is something organic and friendly about the number this year. 2009 was kind of mean. Like a disapproving teacher. 2008 felt puffy and awkward. 2007 was slim and vapid. 2006, well, for me it sucked bigtime. I feel like 2010 is the year all good things come together! Your socks look warm and toasty, as do the cookies (my favorite!). Beautiful socks – I really like the colors, and the stripes, and the fun little spot of pink on the heel. “twenty-ten” is the only way. Surely we all said, “Nineteen-ninety-nine”, not “Nineteen hundred ninety-nine” or “One thousand nine hundred ninety-nine” It’s about time we got used to living in the 21st century. Those socks are so pretty, and those cookies look amazing! !